We have a team of professors and senior engineers, who have devoted all their lives to do research and development in solar energy and environmental-protection products. We also have in our employment a team of marketing and management personnel. 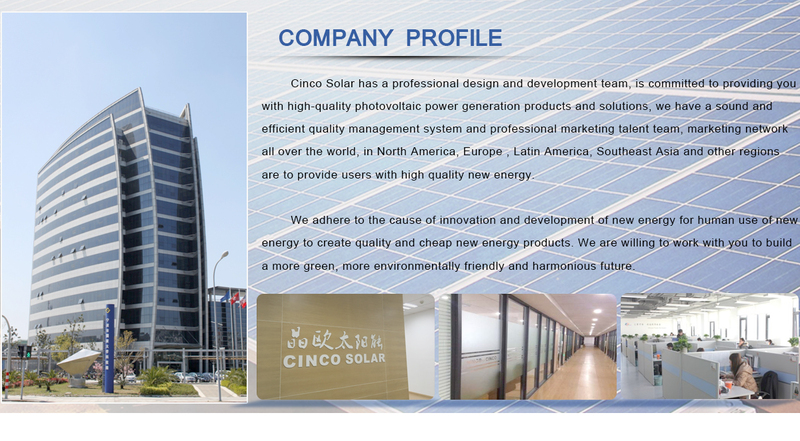 Cinco Solar- specialize in the research, development, design, production and marketing of solar products and electronic environmental-protection products. These lines cover grid tied PV solar system,off-grid solar system,grid tied wind generator system,off-grid wind generator system,solar panel,solar charger controller,solar Inverter,solar street light,Solar Water Pump,etc. We have a team of professors and senior engineers, who have devoted all their lives to do research and development in solar energy and environmental-protection products. We also have in our employment a team of marketing and management personnel, who are dedicated and experienced. We market our products worldwide. As they are innovative, of high aesthetic value and yet, at competitive prices, they are very well received by our customers from all over the world.